Boing Boing Contest Post Mortem -- Onslaught! There are a lot of game development contests out there, and for the longest time it’s felt like we kept missing them. We’ve been hard at work the last several weeks improving Onslaught! after entering in the Boing Boing contest (Post-mortem coming soon!). 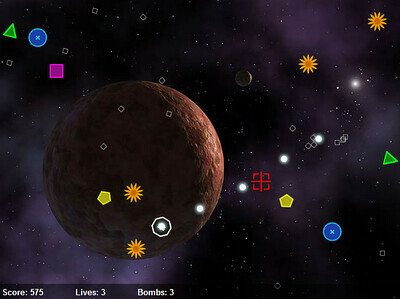 Our Boing Boing "Games Inspired by Music" entry - Onslaught! Our game, Onslaught!, has been selected as a finalist in Boing Boing’s “Games Inspired by Music” competition! I blame my father for my obsession with making video games. It was he that introduced me to the wonderful world of BASIC on his Commodore 64. Dad was a gamer at heart and, just like me, has a passion for tinkering with computers. The very first reason I had for learning to code was to make a game. Fast forward quite a few years and I’ve yet to fulfill that initial dream of making a game. Now, when I say “making a game” I don’t mean prototypes and incomplete demos. I’m talking about actual, complete and polished games. The kind that people would be willing fork over cash to play. Why have I failed to produce a completed game? Good question. There are quite a few reasons. None of them are unsurmountable obstacles. It is my hope, however, to overcome these previous barricades by acknowledging (and documenting) their existence and plotting their demise. Let’s walk through a few of my stumbling blocks. Although I’ve not shipped any games, I have spent the last decade writing lots and lots of code. Coding for a living really limits the amount of time I can seriously dedicate to making games. However, I don’t regret this for even a second. Instead of spending my time developing prototypes and little RPG demos in the hot language of the week I need to double down on a specific game. Solution: I will focus my game development energy on the game I actually want to make. Feature creep isn’t just a problem for game programmers; it’s one that I struggle with on a regular basis. I’ve found that feature creep is especially nasty for a lone developer working on a game in their spare time. There are so many cool things that can go into games that it can be overwhelming at times. Solution: I will endeavor to keep it simple, release early and iterate often. Trying to wear every hat in the game development cycle can be daunting. In addition, developing in a vacuum robs you of the valuable feedback from others. Sometimes, just the mere fact that someone will be reading my code forces me to avoid shortcuts and bad design. I’ve also found that I really need teammates to help motivate me and to excel in areas where I am weak. Solution: I will surround myself with passionate developers who share my vision for games. I grew up playing games like the original Dragon Warrior (NES). And from the moment a friend taught me PRINT “hello world” in QBASIC, I’ve been trying to develop my own RPG.